Well, somehow, we all made it to 2017. 2016 was kinda a doozy of a year, wasn't it? As far as anything I had some semblance of control over, it was good...but you can't exactly blame the sentiment behind things like this fairly believable fake move trailer. And if you're someone who's pretty glad to leave 2016 behind, just remember to take what's good and keep moving forward. It's all we can do. Like...*scrambles for an example*...a ha! Trader Joe's Buenalba with Paprika Cheese! Sandy just picked this up, on the second day of 2017, yet this particular cheese was Trader Joe's spotlight cheese way back in October 2016. And, like Betty White, fortunately it has survived into the new year. 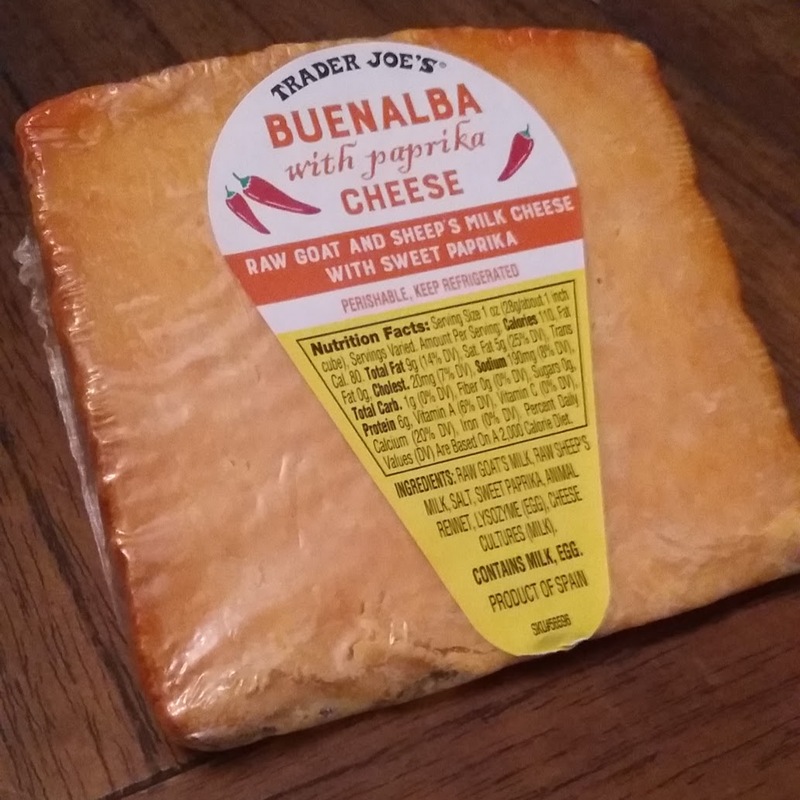 Coming to us from the exotic stomping grounds of Don Quixote (La Mancha, Spain), TJ's buenalba cheese with paprika is raw milk based, from both goats and sheep. I've had other cheeses of similar origins, and have a wide variety of experiences from soft and mild to bordering on what I'd call "viscerally pungent." Definitely place this on the milder, not wilder, side of that spectrum. It's soft yet a little waxy, with a fair amount of creaminess after a few bites that still leaves a little graininess. Almost like bleu cheese, but a little different. That makes for a pretty interesting bite, in my opinion, and one I had to try a couple times to try and get the hang of. The vibrant orange hue, along with the promise of paprika, makes for a pretty spicy looking appearance. Let me assure you: not the case. It's smoked "sweet paprika" (whatever that means) which, honestly, I didn't notice at first, it's so mild. And, this is gonna sound a little weird maybe, but...instead of tasting it, I more felt it. yes, I felt the paprika. There was this soft, gentle warming I felt after maybe my second bite had gone down the hatch that really, on a decently cold winter night, was very welcome. Sandy and I enjoyed our bites by their lonesome, without an accompaniment. We're not enough into the pinkie-raising crowd to be able to suggest a good wine pairing, but you're into that kinda thing, you're probably smart enough to not take whatever some goofball TJ's blog would say about it anyways. For $10.99 a pound, it's a pretty decent cheese to take a flier on if you haven't yet. It certainly won't be the worst cheese you eat this year. I think this might be good on atop of burgers. Or even mac & cheese without needing adding more spices.